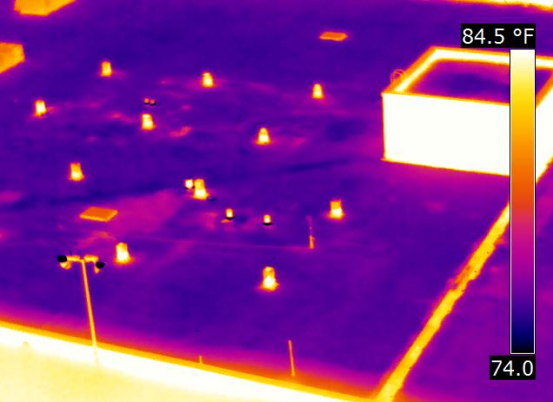 We use only the best Infrared Camera equipment to get superior images and results. One of our cameras is a FLIR T620 has a 640 x 480 detector with an amazing 307,200 pixels to provide the best clarity of your image. In order to provide the most accurate survey possible we try to schedule all infrared surveys when conditions are optimal. This is usually 2-4 hours after sunset with a calm clear night. The conditions present at the time of the survey and several days before the scan can all affect the accuracy . A scaled plan of the roof being scanned for the technician will help document areas containing moisture. Other information about the building, such as building size, current and past uses and roof leak history is useful for the technician to generate the best scan and report. Not all roofs can use infrared thermography. Roofs that have a lot of ballast are difficult because of the stone mass on the roof membrane. The ballast mass will mask the signature of the moisture under the membrane or hold small amounts of moisture that can give a false positive reading. 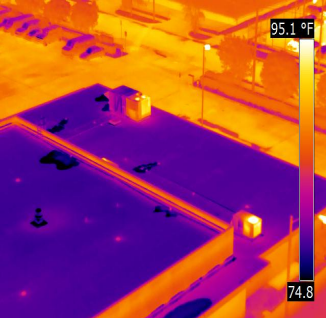 Standing-seam metal roofs do not lend themselves to Infrared roof scans. Other roofs that can have problems are roof that has a reflective coating, such as aluminum paint, applied. The heat signature of the moisture is obscured by the reflective heat of other nearby items on the roof. Some of these problems can be avoided if there are elevated locations nearby so a more perpendicular scan can be performed. We have found that roof leaks are almost always found within the area of water penetration of the roof insulation . Infrared roof scans are not only an option for locating leaks to evaluate cost difference between roof repair and roof replacement. 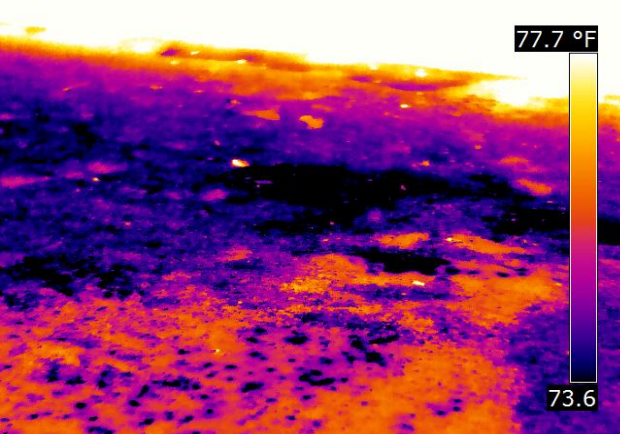 Any qualified Roof Asset Management Plan should include an Infrared Roof Scan approximately 6 months after a roof is repaired or replaced to verify that the roof was properly installed and absence of leaks. This is a great way to provide building owners acceptance of the installation job, performance bond, warranty activation or other insurance issues. Regular roof scans will also locate problems earlier and make repairs less expensive if performed on a biannual basis. All scans fully document their finds in a digital format that is easily storable and traceable. We will be happy to bid on your routine roof scans at a discounted basis because you are a repeat customer. Unless stated in the bid, your Survey will be performed at the Roof Survey with limited report. If considerable leakage if found, the detailed report is recommended. The detailed report includes marking areas with semi permanent markings and returning during day light hours for a second evaluation of the roof membrane. Areas are measured and marked on the roof plan with the total square footage of wet insulation compared to the total roof area to help determine if repair or replacement is more cost effective.